"Vinegar can be made from any fruit, or, in fact, from any material which contains enough sugar and is in no way objectionable. 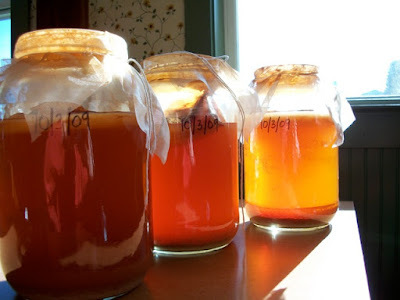 Whether it is done on a small scale in the home, or on a larger scale on the farm, or in a still larger scale in the factory, the production of vinegar is the result of two distinct fermentation processes—an alcoholic fermentation followed by an acetic fermentation. By using the materials and following the methods discussed in this bulletin, vinegar of good quality may readily be made from apples, peaches, grapes, and other fruits, large quantities of which are wasted each year in the United States." The making of vinegar using apples, grapes, oranges, peaches, persimmons, pears, berries, honey, maple syrup, watermelons, grains, and molasses is discussed. Fermenting, filtering, clarifying, aging, pasteurizing, and packing are also covered. In addition to simple home vinegar production, a larger-scale, continuous-barrel process is explained. For commercial vinegar production, the bulletin describes how to make and use a "quick vinegar generator." There is also a discussion of "Causes of Failure" and "Animal Parasites" (vinegar eels and vinegar mites). Testing for acid strength of the vinegar is covered near the end of the bulletin. However, the testing process in 1924 seems better suited to someone with a scientific or laboratory background. 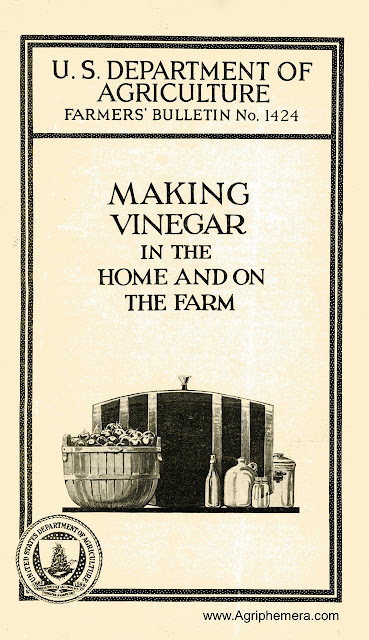 The bulletin ends with "Federal Regulations Governing The Manufacture And Sale Of Vinegar." I would like to recommend a book to read about the healthful attributes of apple cider vinegar, written at length in Folk Medicine, by D. C. Jarvis, M.D. "A famous doctor's guide to folk medicine practices of Vermont--the nature secrets of honey, apple cider vinegar and foods for health" I own the 196l version, and had no idea how beneficial apple cider vinegar is to our health until reading this. This particular book was published by Crest Books. So with this in hand, I'm looking forward to this new download about homemade vinegars! Thanks, Herrick. I was reading some history of Klamath County, Oregon and read 'Vinegar Pie'. So I looked it up and read about Martha Stewart's Pioneer Vinegar Pie recipe. One comment said that their ninety-year-old grandma had learned the recipe while growing up in Texas. It was said that it is a smooth, creamy custard pie with a hint of apple taste! !